Click Here for SPRING Special! 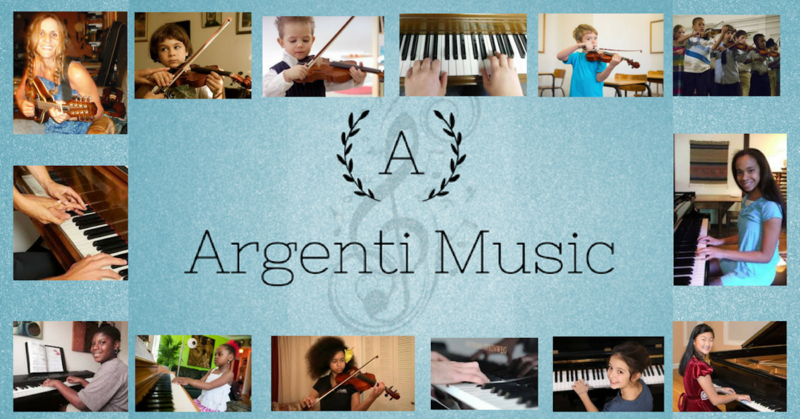 With over 30 years of live performance and teaching experience, professional violinist Jennifer Argenti returned from touring and realized the need for quality music lessons in the community. With a strong desire to always share her music and knowledge everywhere she goes, Jennifer has now made herself available in the North County San Diego area to teach both violin and piano in person as well as virtually. Her plethora of musical knowledge in various genres makes her a high in-demand instructor ranging from beginner students to advanced players. A background in Suzuki ear training and classical studies combined with fiddle, jazz and improvisational skills enables Jennifer to custom tailor music instruction towards each individual student's goals and needs. As an added plus for in-person violin pupils, Jennifer's ability to accompany students on piano during their lessons makes the learning experience that much more valuable. Featured in concert by the legendary WILLIE NELSON and recipient of the Los Angeles Music Awards' prestigious 'INSTRUMENTAL ARTIST OF THE YEAR' award, Jennifer Argenti is originally from Maryland, graduated from the Baltimore School for the Arts, studied violin performance at Baldwin Wallace Conservatory of Music in Cleveland, OH, performs throughout the world and has continued her life-long study of violin at Mark O’Connor fiddle camps and Master classes. She studied blues/rock/jazz at the California College of Music and received a scholarship for jazz performance at the Colburn School of Music. ​She has appeared in Nicki Minaj's Pinkprint movie, commercials, 'The Bachelor’, 'Swedish Hollywood Wives’ and WeTV's ‘My Fair Wedding’ and 'David Tutera Unveiled’. Past shows include performing w/ WILLIE NELSON, JR Richards of DISHWALLA, Michael Einziger of INCUBUS, IRATION’s Micah Brown and opening for LITTLE FEAT, THE REVEREND HORTON HEAT, LIT, THE MOTELS, WANDA JACKSON, BERLIN and grammy winning country artist TRAVIS TRITT. Other passions include environmental conservation, animal ethics and surfing. She is an avid athlete and holds a WSA Champion surfing title and finalist title in the Quiksilver USA Surfing Championships. My child has no experience. Is that okay? Absolutely! I welcome beginners. What ages do you accept? Ages 5yrs and up. Seniors are welcome! Please ask about our senior discount. * Exceptions will be made for younger students as well as those with attention or learning challenges. Your rates seem to be a little more than the average music studio lessons. Why? ​Lesson packages at studios are usually only 30 minutes in length making the rates seem more affordable. My lessons are 45 minutes. Many lessons that cost less are by less experienced instructors. Now imagine learning from me, a featured musician by Willie Nelson and many other notable artists. The knowledge and experience I bring to your lessons is priceless. Do you come to our home or do I come to you? Lessons are conveniently located in my south Oceanside location. What is the "Spring Special"? Please click HERE for the "Spring Special". Will you help with preparing for auditions? I have a LOT of experience with auditioning and I absolutely welcome students preparing for their upcoming auditions. I don't want to study classical music. Is that okay? Of course! Though keep in mind there are always basics you need to learn first, but if you come to me with a song in mind, we will make that the goal of your lessons. Do I or my child have to have our own instrument? Students are required to have their own violin or piano/keyboard. However, if you do not have an instrument yet, I am happy to assist in acquiring one. You've performed all over the world and with some big name artists! Why are you teaching now? Yes, I am so very fortunate to have had such an amazingly full musical life. But now it's time to share my knowledge with others so they may start their own musical journeys! What methods of payment do you accept? Cash, check, Venmo, direct deposit and credit cards. ​Congratulations on taking the next step towards pursuing your dreams! Please provide the following and you will be contacted shortly.